Get ready to explore the biggest park in the Southwest with some of the least visited (but most glorious) wilderness areas. Colorful ridges, slot canyons and rock formations abound in a landscape recently threatened for its mineral-rich earth. Pay homage and show your support to preserve this precious piece of Utah wilderness. Grand Staircase-Escalante National Monument is big, beautiful and mostly unmaintained with few designated trails, and a relatively short drive from its popular neighbor, Bryce Canyon National Park. The Escalante River Canyon is the most popular area to hike, with its narrow slot canyons, bird life and arches. The Grand Staircase is more remote (and thus a great place to find some solitude). In the middle is the 1,600-square mile Kaiparowits Plateau, with its wild sedimentary rock formations and fossils. Check out our map to get a sense of the layout, and take a look at this great “before you go” brochure from the BLM, and interactive map of the area. Don't miss hiking the Lower Calf Creek Fall Loop, the short and sweet Spooky Canyon Loop via Peek A Boo & Spooky Trail, and the impressive and more challenging Tunnel Slot Canyon Loop and Zebra Slot Canyon. The Visit Utah website offers great ideas on what to see and do. Make sure to check current road conditions before you go. Use existing campsites and fire rings, and always pack it in, pack it out! Yes, that includes your solid waste, IE: Poo. Bags can be purchased at the visitor centers. Note that fires aren't allowed in any wilderness areas, canyons or off of Spencer Flat Road. 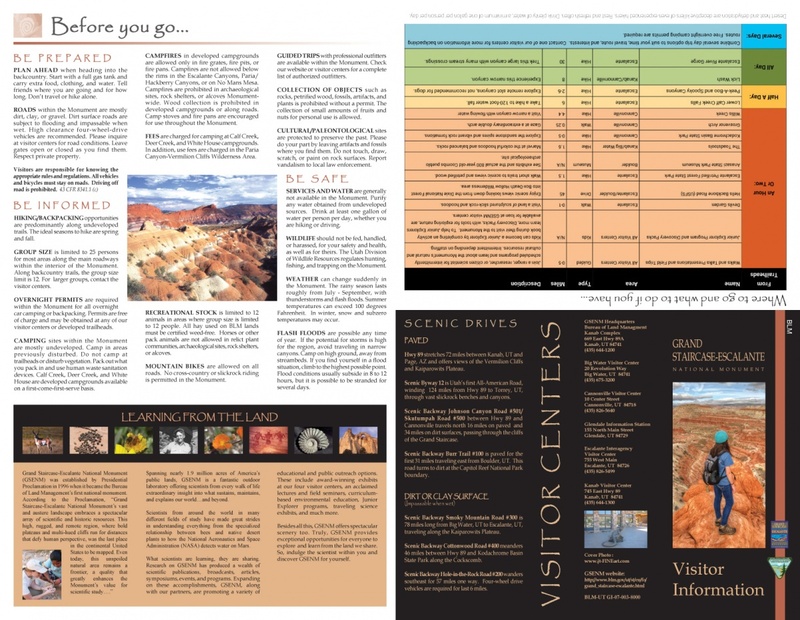 Pop into the visitor centers to get the most up to date information on water, fire restrictions and other important details, and download the handy Escalante app in the app store to help plan your visit and find safety alerts. Because of the recent proclamation changing the boundaries of the park by President Trump, keep an eye out for updated information on the BLM.gov site. And of course, don't hesitate to give the visitor centers a call. Get contact details, here. Spring and fall are a great time to visit, given the brutal summer temperatures and risk of hypothermia in the winter. That said, winter is a great time to visit for those well prepared and looking for a quieter experience. Any time of year, make sure you have a full tank of fuel and plenty of provisions, especially if heading into the more remote areas. Permits are required everywhere, but are free and unlimited. Pick them up at any visitor center or at the trailheads. Dogs are allowed on leash in the monument, but make sure the trail you're starting on doesn't end up in a wilderness area of neighboring Glen Canyon, where dogs are not permitted.